4 lucky ladies from Devon are joining the cast of The Ladykillers on the Theatre Royal stage after being nominated by their grandchildren. All four women were entered into a competition called ‘Nominate Your Nan’ by their grandchildren, as the Theatre Royal searched for four ladies who could make up the ‘swarm of old ladies’ mentioned in the script. After being shortlisted, they were invited to the theatre to meet the Theatre Royal’s Associate Director Nick Stimson, who decided on the final four. 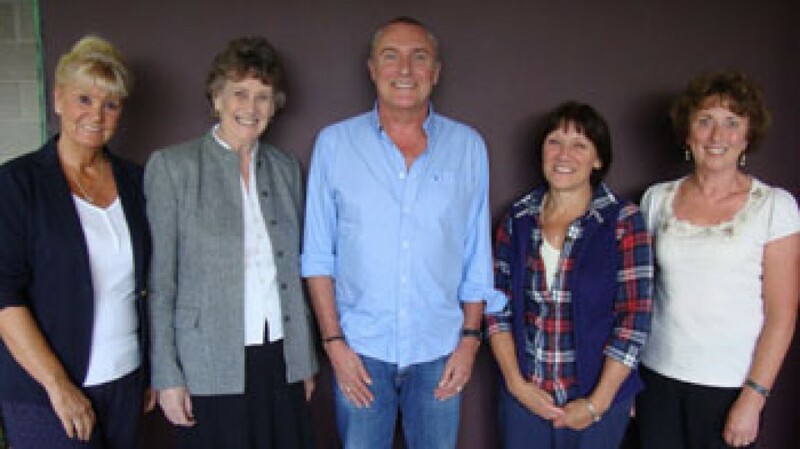 The women will be onstage in every performance in Plymouth alongside Michele Dotrice, who is playing eccentric little old lady Mrs Wilberforce, and Clive Mantle and Shaun Williamson, who are part of a gang of unlikely criminals who plan a heist and decide to use the unwitting Mrs Wilberforce as their cover. The winning ladies are (from left to right in the photo) Jean Godefroy from Plympton, Jacquie Booth from Chaddlewood, Corinne Shutt from Walkhampton and Dee Ellis from Hooe, pictured with Nick Stimson. The Ladykillers runs at the Theatre Royal Plymouth from Friday 14 until Saturday 22 September. For more information about the show, or to book tickets click here.